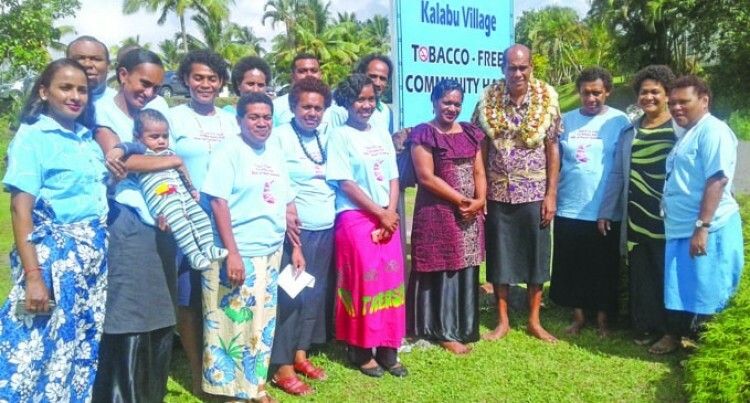 A village in Nasinu outside Suva has been commended for its residents’ efforts to create a tobacco-free environment. Kalabu Village in Nasinu became the first this year to declare its boundary a tobacco-free zone. This programme was launched by the Ministry of Health and Medical Service in partnership with the World Health Organisation. More than 100 people gathered at the Kalabu Community Hall to show their support for the project, which aims to raise awareness on the health hazards of smoking and its consequences. The programme was officiated by the Ministry of Health and Medical Services’ National Adviser for NCD and Wellness, Dr Isimeli Tukana. The delegation was accorded with the traditional welcoming ceremony. A billboard stating, “Welcome to Tobacco Free Community Hall,” was unveiled as part of the community’s commitment to ensure strictly prohibit any smoking or tobacco consumption in the community. Before unveiling the billboard Dr Tukana co-ordinated the awareness session with the community members on causes of smoking on health. “Tobacco is the key barriers to the NCD and we are targeting that by 2035 less than 5 per cent of Fijians should be still smoking at the moment we are sitting at about 30 per cent,” Dr Tukana said. He said the target for this declaration was to protect people who did not smoke. “We are not stopping the smokers, we are saying to them to go out of the hall and smoke,” he said. He said before the communities were declared as tobacco free they underwent three weeks of training. A community member, Sereana Sewabu, wished that this declaration had come earlier. She said it would now be safe for non-smokers in the community. “Today there are more young people smoking and getting NCDs,” Mrs Sewabu said. She said these days more young people were dying because of smoking compared with older age people. She said more community villages should have tobacco free community halls where people did not become passive smokers.